Huntington’s disease (HD) is an incurable hereditary disease of the nervous system that affects movement, thinking, mood and behavior. The gene that causes Huntington’s disease was discovered in 1993, and it is now possible to insert the abnormal gene into various animals, then test drugs for potential effects to slow down the devastating condition. A number of promising drugs have been identified in this way. However, this now means that it is critical to enroll research participants into human studies of these drugs as well as into studies that help to better diagnose HD and better design new human studies. At this time, there are studies available for patients with early symptoms of HD as well as studies for people at risk for the disease and HD family members. For more information, please call Jeana Jaglin, RN, at (312) 563-2900. 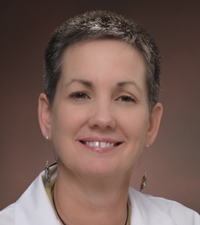 Kathleen M. Shannon, MD, is an associate professor of neurology at Rush University Medical Center. Her clinical practice focuses on Parkinson’s disease, Huntington’s disease, dystonia and other movement disorders. This entry was posted in Neurology and tagged HD, Huntington's Disease, movement disorders. Bookmark the permalink.